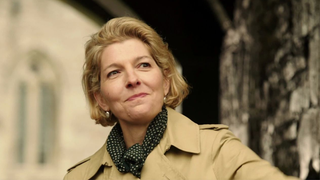 But as great as it is to be getting more Kate Stewart stories, the announcement potentially has far bigger implications for Big Finish's Doctor Who output going forward. Up until now, the revived-era of Doctor Who has been strictly off-limits to Big Finish for their stories. They've made insinuations towards elements of it, especially with the Time War, and in turn the show has nodded towards the audio plays itself — such as when The Night of the Doctor effectively canonised the Eighth Doctor's audio companions back in 2013. Kate actually marks the first time that Big Finish will be allowed to explicitly use a character and plot elements from the 2005-and-onwards era of the show, and obviously, that opens up even more possibilities for other characters to make the transition from TV to audio plays. Even former Doctors Christopher Eccleston, David Tennant and Matt Smith (Tennant is no stranger to Big Finish, having appeared in multiple plays for them before he was cast as The Doctor)! Only time will tell if Big Finish and the BBC's new deal could extend beyond the adventures of Kate Stewart, but here's to hoping. Who wouldn't want more stories from NuWho's past Doctors?